FLEX IT FIRST: CARBON ARROW PUBLIC SAFETY NOTICE! NEVER FIRE A DAMAGED ARROW! No matter what type, size, brand or style of arrow you choose to shoot, you must always inspect each arrow for damage before each shot. Proper care of your new arrows can ensure years of quality performance. However, arrow shafts are not indestructible. Arrows are lightweight projectiles, so they can be damaged through normal use (and via transport, impact, crushing, etc.). Be advised, shooting a damaged arrow is extremely unsafe! You could be seriously injured. Never assume ANY arrow is safe - NOT EVEN A BRAND NEW ARROW - until you have verified it yourself. It is your responsibility to check your equipment and be sure your arrows are always in good condition before you fire. To inspect the arrow for defects, hold it on both ends and flex it away from yourself (and others) while visibly and audibly checking for splinters, cracks, nicks, or dents. Rotate and repeat this inspection several times to make certain the arrow shaft is not damaged in any way. If you find the arrow to be damaged, DESTROY IT immediately. A damaged arrow is an accident waiting to happen. Shooting damaged arrows can result in arrow failure and possible bodily injury. Ironically, the reason most arrows become damaged is because modern equipment is simply too good. In years past, the recreational archer was often happy with paper plate accuracy and groups of 4-8" within a typical bowhunting range. But those days are long gone. With modern equipment, even a novice archer can practically pile arrows into the same hole at 20 or 30 yards. 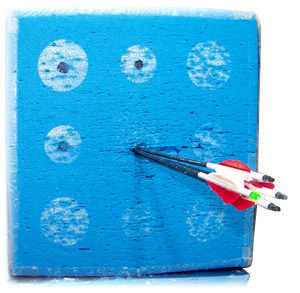 Unfortunately, shooting tight groups means there is a chance that an incoming arrow can strike and damage another arrow that's already in the target. If one arrow strikes another, the force of the impact can cause lateral cracks or dents to the shaft. This dramatically weakens the arrow shaft, and if you fail to flex-test the arrow before firing it again, you may not detect what has happened. When you later fire the (damaged) arrow again, it can buckle and snap upon release. This will put your bow hand (the hand holding the bow) at great risk of making contact with the moving segments of the broken arrow. Unfortunately, in a toughness contest between your hand and an arrow shaft, the arrow shaft always wins. It is very important your graphite arrows are trimmed to the correct length to match your equipment. Arrows that are too short can become lodged in the arrow rest or behind the riser of the bow (obstructed path). Shooting an arrow that is lodged in a bow or arrow rest in this manner will almost certainly result in arrow failure, damage to your equipment, and/or personal injury. The end of your arrow shaft (not including the tip) should sit approximately 1 inch (2.4 cm) in front of the arrow rest (or more) when you are at full draw. An arrow that is "just long enough" is too short! Please note that changing your bow’s draw length and/or draw stop peg setting (for bows equipped with this feature), will likely change your arrow length requirements. Also, as your bowstring ages and stretches (as all bowstrings do) your bow's effective draw length will slowly increase over time - particularly if the string set is left in service for an extended period. If you choose not to have your string serviced and replaced at regular intervals, be advised that your bow's arrow length requirements may change with time. Before firing your arrow, make sure the nock is properly seated all the way against the string. Be advised that some nocks use a "2-click" procedure, where the nock isn’t fully seated until you hear the second click. Failure to properly nock your arrow on the string may cause the arrow to fall (or partially fall) from the string during the drawstroke. This could result in a dry-fire or an obstructed path shot which could damage your equipment and/or cause bodily injury. We apologize for the graphic nature of this photograph, but we need to drive this point home as forcibly as we can. This gruesome photo was provided by fellow archer P. Giblin from Houston, TX. THIS IS A WHAT CAN HAPPEN IF YOU FIRE A DAMAGED ARROW. While statistically this type of injury qualifies as a "freak accident", it does happen to a number of archers each season. And while it may be intuitive to blame the arrow, the reality is that all brands, all types, all models, and all sizes of arrows can fail upon release if they are damaged prior to the shot. Don't assume expensive arrows are any less susceptible. They are not. Any arrow, aluminum or carbon, small diameter or large diameter, camo finish or black finish, light or heavy, cheap or expensive, popular or obscure, WILL BREAK IF THE ARROW SHAFT INTEGRITY IS COMPROMISED PRIOR TO THE SHOT. If you ignore flex-test safety procedures, your damaged arrow shaft can buckle and snap when you shoot it again. Unfortunately, some of the broken pieces will likely continue accelerating, often with unpredictable direction. If you're lucky, the broken pieces will fly away from you and your bow hand (the hand holding the grip). If it's not your lucky day, you'll be making a trip to the emergency room. So don't risk it. ALWAYS CHECK YOUR EQUIPMENT FIRST! If you have other questions about arrow safety or any other concerns about your new arrows, please call our pro-shop for further assistance. We hope you get years of safe and trouble-free enjoyment from your new custom arrows. IS ARCHERY A STATISTICALLY DANGEROUS SPORT? No, statistically, archery is twice as safe as golf or fishing. The U.S. Consumer Product Safety Commission (CPSC) operates the National Electronic Injury Surveillance System (NEISS)1, which is a database used to track hospital injuries for more than 15,000 kinds of consumer products used in sports and recreational activities in and around homes and schools. 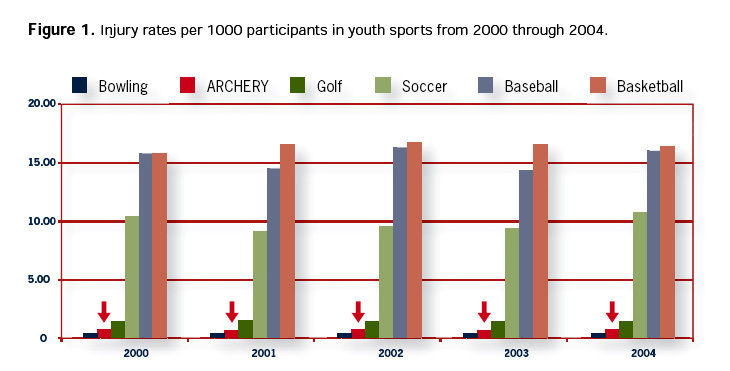 Their study confirms that archery is among the safest of all sports, ranking just above ping-pong and bowling in number of injured participants per year. The sport of archery maintains a consistently high safety record despite the fact that participants range from grade-school children to senior citizens, many of whom have never before picked up a bow and arrow. Nonetheless, periodic archery injuries are a reality of our sport, most often because archers simply forget to follow safety procedures. So don't be the one in a thousand who ends up in the emergency room trying to explain how he managed to shoot himself with his own arrow. FLEX-TEST YOUR ARROWS EACH AND EVERY TIME YOU SHOOT! We sincerely hope you have a safe and enjoyable archery experience and we strongly encourage you to practice and share this information with other archers.